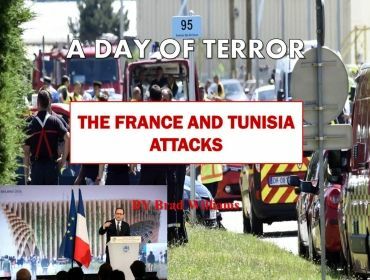 Friday 26th June 2015, the day when three attacks were carried out in France, Tunisia and Kuwait. The number of people dead is increasing all the time. A man has been decapitated during a suspected Islamist terrorist attack at a chemical factory in Saint-Quentin-Fallavier near Lyon, south eastern France. 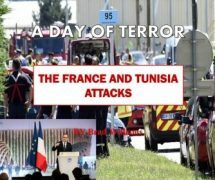 This attack took place on the same day that only hours later another terrorist attack gripped Tunisia which killed 38 people. The suspect, Yassine Salhi, was flagged in 2006 for suspected ties to radical Salafists, France’s Interior minister Bernard Cazeneuve said. He is believed to be a firefighter. It is believed four people are being held by French police in connection with the beheading of a man in Southern France. * A car ploughed into the factory and the suspects set off two explosions. * The attack took place just before 10am local time when two suspects drove into the Air Products factory. *The vehicle crashed the gate and ploughed into gas canisters which caused an explosion. * One man was found decapitated and two others were injured in the attack. * A suspect, who was known to French intelligence services, has been arrested. At least 38 people have now died following the devastating attack on a holiday resort and beach in Sousse, Tunisia. 15 people from Britain have died in the attack. The UK government described the events as ‘the most significant terrorist attack on the British people since 7/7’. That number of the deceased is increasing. It has been confirmed that the first Welsh victim to have died in the attack is Trudy Jones from Blackwood in South Wales. Many Brits were on holidays enjoying the sunshine, many sunbathing, when a gunman opened fire; spraying bullets all across the beach. He then followed some tourists, who feared for their lives, back to their hotels where he opened fire once again. As a result, he killed 38. A man from Pontypridd, Mathew James, was hailed a hero as he shielded his girlfriend from gunfire. He was shot three times, he has now returned home to Wales. Also, a Swansea family ran for their lives on the beach where the gunman opened fire. Shelly and Ben, a couple from Cardiff, witnessed the attack. Shelly told ITV Cymru Wales, “I thought it was fireworks.” They then went on to say how they quickly realised something very serious was happening. Cardiff Airport has advised travellers to contact their travel operators following the Tunisian attack in which dozens have been killed. It comes after several operators have cancelled flights to the popular tourist destination. The Foreign Office has also released warnings to people looking to fly to Tunisia.